The Pebbles and Stones teaching model has been a part of NorthPointe Christian Elementary School (NPC), in Grand Rapids, Michigan, for over ten years; first in their traditional classrooms and chapel and now in their home school hybrid program. This long-term partnership has helped many children learn to listen to God's voice and grow in their relationship with God. Julie Ellens, director of the homeschool hybrid program, explains, "The students read two Bible passages each week and then respond to each passage in a Pebbles and Stones journal type format. They share their entries with each other in an inter-generational aspect modeled by Pebbles and Stones. The whole family works on it together regardless of student grade. During our chapel time, the students especially like praying for each other. They share praises, confessions, and authentic requests. I love seeing the community that they build together." the gospel message. 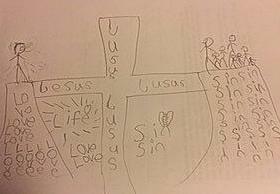 One mom was so excited about her son's picture of the gospel that she posted it on Facebook, telling all of her friends about her son's ability to tell others about Jesus." Another family has an older child with disabilities. They were so excited about the opportunity to study and journal as a family. They have commented several times on the meaningful discussions that they have had as a family. In January, NPC welcomed us to be part of their January WOW (Win Our World) week. The week's focus was to think of others, pray for them, invest in them, and point them toward God. Assistant Principal, Karen Vanderberg, explained during WOW week, the students make Blankets of Blessing for neighbors in their community: senior citizens, teens in youth homes, and others experiencing loneliness. They pray for the unknown recipients in every step of the process from gathering supplies, to cutting, to creating, to delivery. Their prayer is for the recipients to know and experience God's love. Kathleen Trock-Molhoek was invited to a breakout session during WOW week to read her book Hiding Places. She engaged the children by asking them to share about their favorite hiding place and acknowledged that we all have hiding places as did Adam and Eve. After listening to the story, the children took time to reflect on the story and on David's exclaiming, "Oh, God you are my hiding place." and to journal. Several of the students shared their thoughts which led to a time of prayer. The teachers present were inspired as they heard the students sharing about their hiding places and praying for one another. Each of the 200 students at NPC received a copy of Hiding Places in Spanish and English. Assistant Principal Vanderberg reported, "The students were so excited to receive a gift in the middle of this WOW week which focuses on giving."